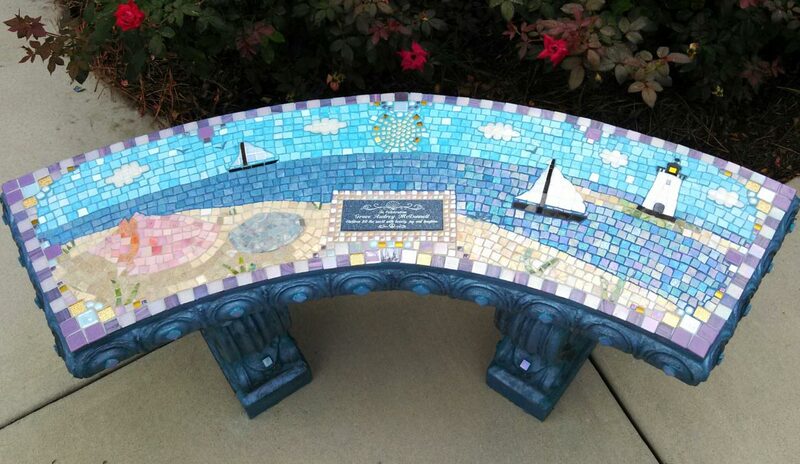 Mosaic garden and memorial benches are custom designed in a variety of different styles. From landscapes and seascapes to butterflies and angels, custom designs are available to suit your individual specifications. 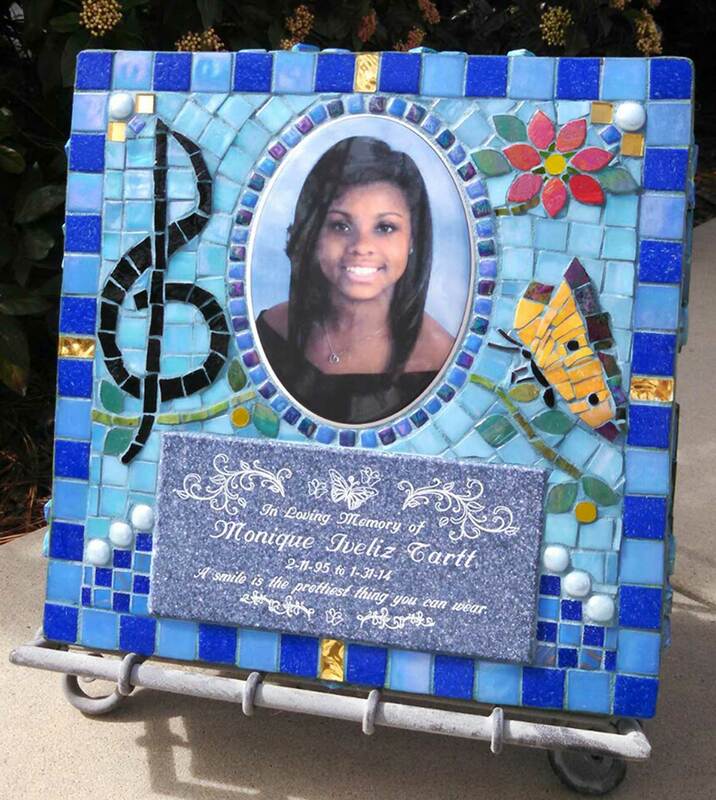 Memorial garden stones are one of a kind mosaic garden art pieces uniquely created for each client. Sides are finished in a mosaic flowers and leaves making the memorial art stone visually beautiful from every angle. 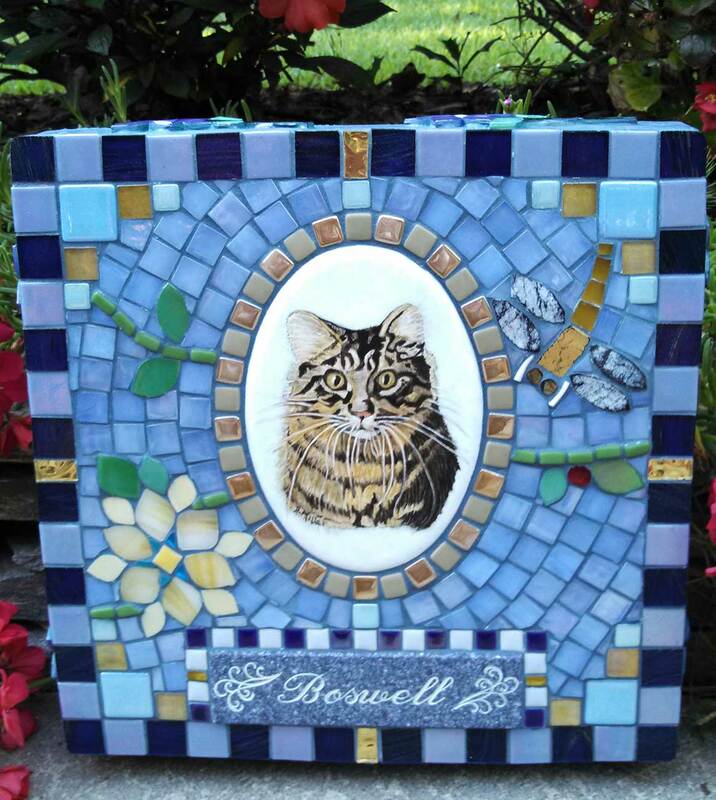 A Mosaic Memorial Pet Portrait Stone is a beautiful way to remember your beloved friend and companion. The picture portrait on the pet memorial is your own special photo of your lovable pet. 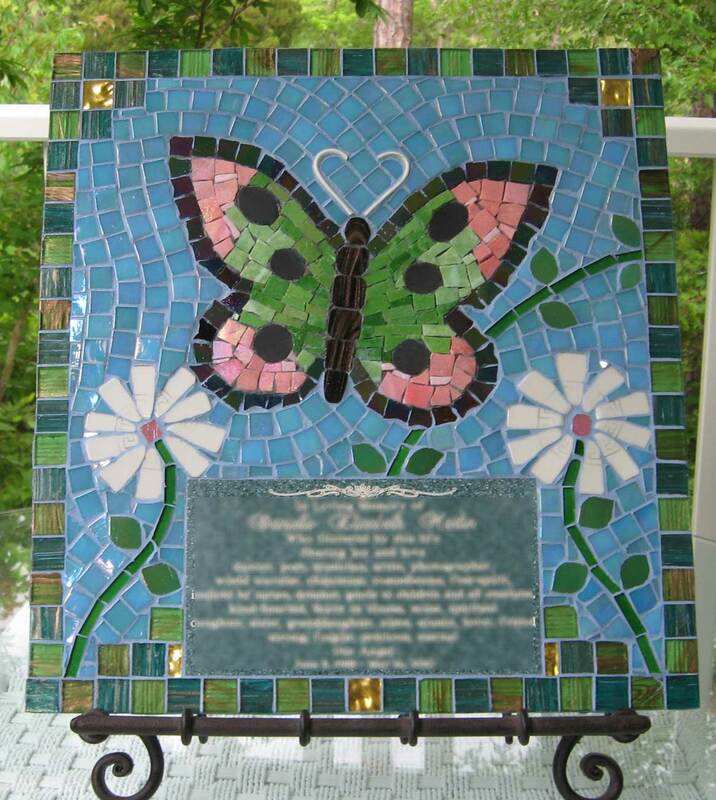 Mosaic Memorial Picture Plaques are a wonderful way to display the memory of your loved one, pet or special place in a unique way. The picture plaques are ready for hanging or they fit well into a picture stand. 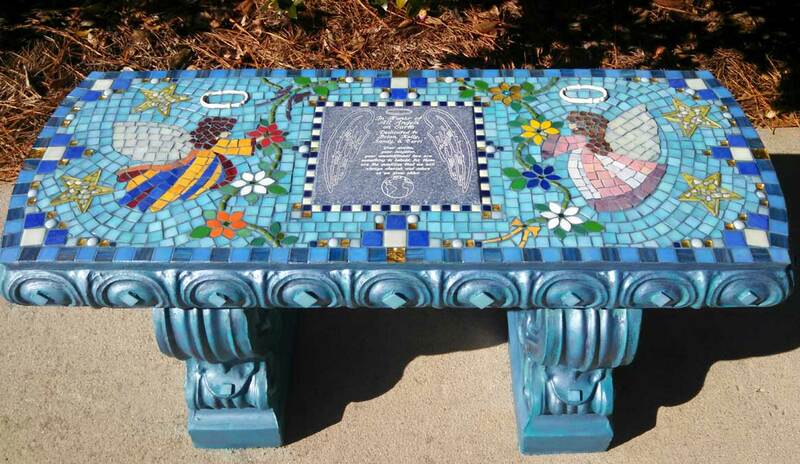 Water's End Studio specializes in custom Italian glass mosaic memorial garden benches and stones created by both client and artist as a beautiful place to sit and find peace in one's thoughts, especially in a time of loss. 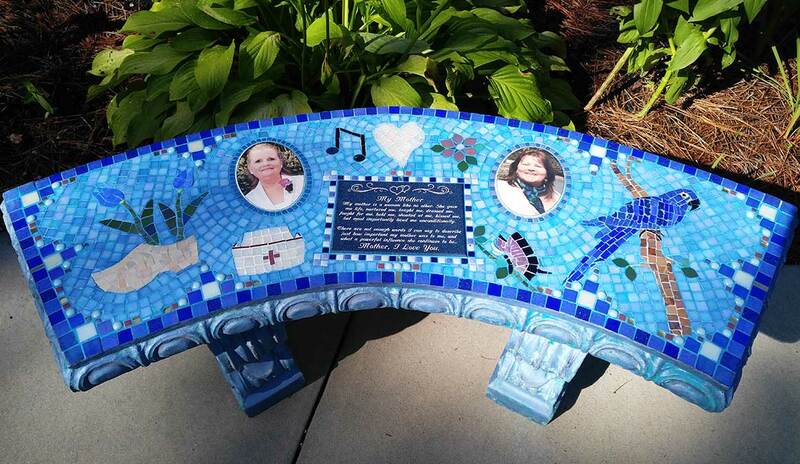 Water's End Studio's personalized, handcrafted mosaic memorial benches are celebratory, stone-like art pieces capturing the memory of a loved one. 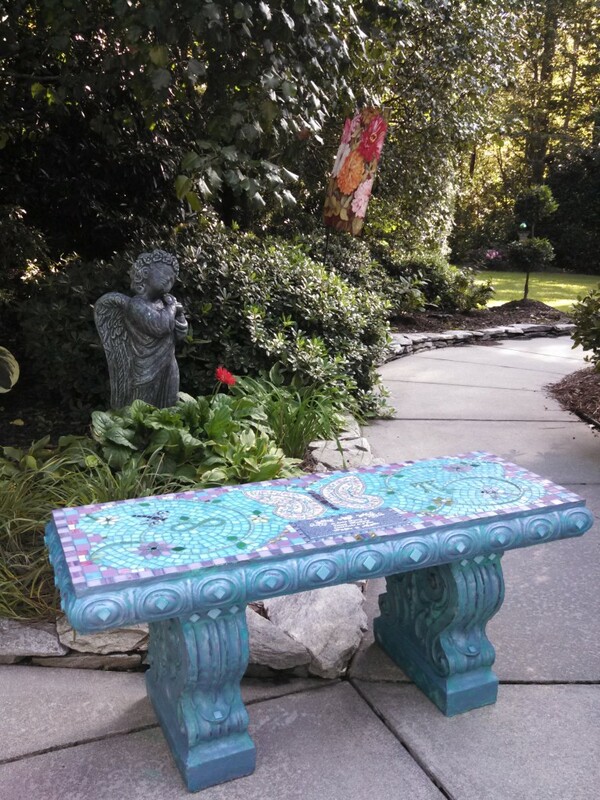 These extraordinary mosaic garden benches and garden stones are hand crafted, one of a kind art pieces created by Inner Banks artist Linda Solby. Smalti from Italy and Mexico, as well as highly reflective Venetian glass are combined to form a medley of fine design. Sharp edges are dremeled to perfection reflecting the sunlight and leaving the surface smooth to the touch. 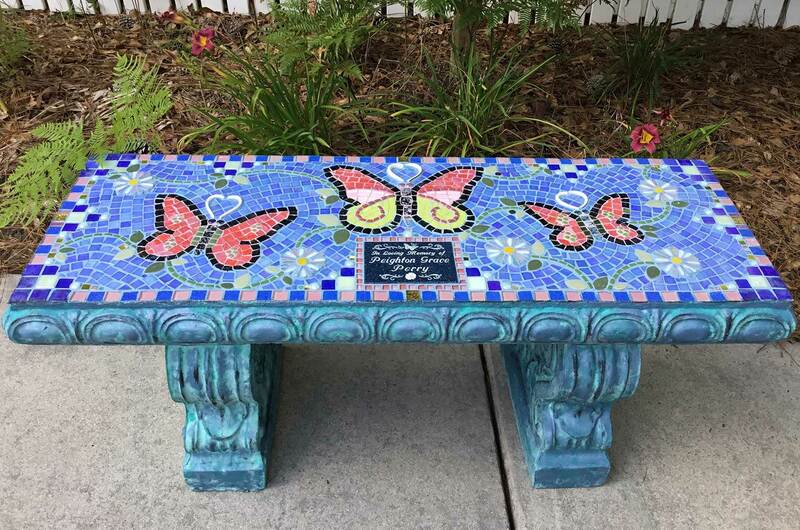 Because the benches and stones weather well outdoors and the beauty endures, these mosaics are the perfect way to memorialize a loved one. Each bench or garden stone is custom designed after discussion with the client customer. This artistic, collaborative piece, dedicated to the one you love, is a reflective expression of your loved one and your feelings. A garden stone or bench is a beautiful way to celebrate memories. Personal items can be incorporated making the design very special. 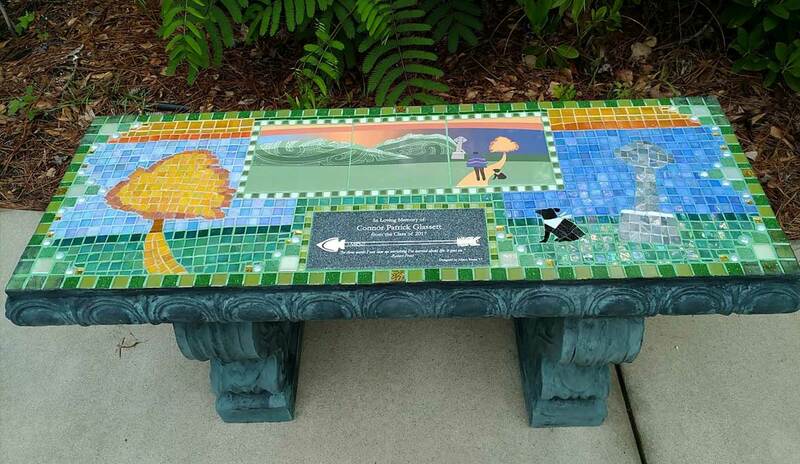 Let artist Linda Solby walk you through the process of custom designing your beautiful mosaic memorial or garden bench, stone or plaque today.